If your child is blown away by pirate movies, he or she will love emulating his or her favorite swashbuckler this Halloween. 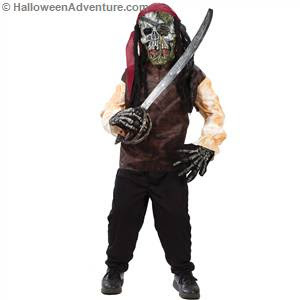 From the hottest, modern pirate films to the coolest, classic pirate characters of yesterday, HalloweenAdventure.com delivers children's pirate costumes like no other costume retailer. With the vast amount of pirate costumes available on the market today, you may be having difficulty finding the perfect one for your child. You probably want something sensational that is as unique as it it interesting and you certainly don't want your child to blend in with the crowd this season. That's where Halloween adventure comes in. We stock some of the most impressive children's costumes on the planet and our pirate costumes rival most theatrical wardrobe collections. Today's pirate costumes don't have to be blatant stereotypes complete with eye patches and hooks. Today's costumes are trendy, cool, and interesting. They're as unique as the children that wear them and they're as comfortable and as durable as your everyday attire. High Seas Buccaneer: If your child enjoys adventure and can't get enough of pirate films, he'll love our impressive High Seas Buccaneer children's pirate costume. From the tip of his pirate hat to the bottom of his boot covers, this snazzy swashbuckler is ready walk the plank in style! Available in boy's and girl's styles, the High Seas Buccaneer costume is sure to be a big hit this season! High Seas Sweetie: If your preteen daughter is trendy and fashionable, she'll love wearing our ultra-cool High Seas Sweetie costume. This swashbuckling sweetie is sensational enough to walk the catwalk in high fashion this season. Complete with a skull and crossbones printed top with net sleeves, black maxi skirt with net bottom, black & white hip wrap, and red head tie, this modern pirate costume is sure to turn heads this Halloween! Lady Pirate: If she's stylish and sophisticated, she'll look superb in our elegant Lady Pirate costume. This luxurious lady is nothing short of a high class businesswoman whose business just happens to be plundering and pillaging! Complete with an incredible pirate dress and matching hat, this sizzling suit is perfect for the finicky swashbuckler! 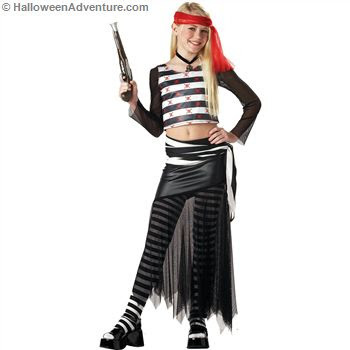 Punk Pirate: If she has a spunky, boisterous, attitude, she'll love expressing her wilder side in our adorable Punk Pirate costume! This funky costume comes complete with a trendy black and pink pirate costume dress and a matching hat. She'll be ready for high-spirited adventure on the high seas the moment that she sees this awesome children's costume. Pirate Boy: It'll be a pirate's life for him the moment that he sees our cool Pirate Boy children's costume. This classic costume is perfect for the pirate who likes to keep things simple. After all, is high fashion really an issue when you're making others walk the plank? Pirate Girl Betsi: If she's a little rough around the edges and has her image to think of before she gallivants around in a cutesy costume, she's sure to be impressed with the air of rebellion she gives off in our cool Pirate Girl Betsi costume! This spunky pirate has no regard for the rules of parlay or any others you can throw out at her! Pirate Skeleton: If he likes his high seas adventures a bit darker than the norm, he's sure to love the thrill he'll get from wearing our Pirate Skeleton costume. This frightening fiend will do whatever it takes to protect his treasure and he's not afraid of offending others to do it. This one is perfect for the horror seeking, swashbuckling scavenger! Captain Jack: If he loves Disney's Pirates of the Caribbean, he'll love pillaging in the Captain Jack Sparrow costume! Captain Jack is witty, clever, and cooler than ever and your child will be too in this officially licensed Pirates of the Caribbean costume! (We carry a large selection of officially licensed Pirates of the Caribbean costumes for children and adults including: Elizabeth, Davy Jones, and MacCus costumes! These are just a sampling of the incredible pirate costumes available at HalloweenAdventure.com. We carry one of the largest and most impressive selections of pirate costumes for children, adults, teens, and infants that you'll find anywhere. And with our state-of-the-art, securing ordering platform and expert customer service staff, you're sure to be pleased with every aspect of your purchase. So, what are you waiting for? Halloween is just around the corner and a world of pirate costumes await you at HalloweenAdventure.com!